While browsing Facebook on my iPhone, I tapped on a map to see where a friend had checked in, noticing that the much-maligned (but constantly improving) iOS Maps app shows Lower Northside as a distinct neighborhood. Of course, this is because Apple uses Urban Mapping for neighborhood data, and as I’ve mentioned before, so does the popular city profiling site City-data.com. I thought this was interesting because a lot of people use iPhones to navigate, and if they’re looking at this area, they’re seeing it labeled as Lower Northside. So even if one could argue that LoNo doesn’t deserve consideration as its own neighborhood, Apple has effectively made it so. 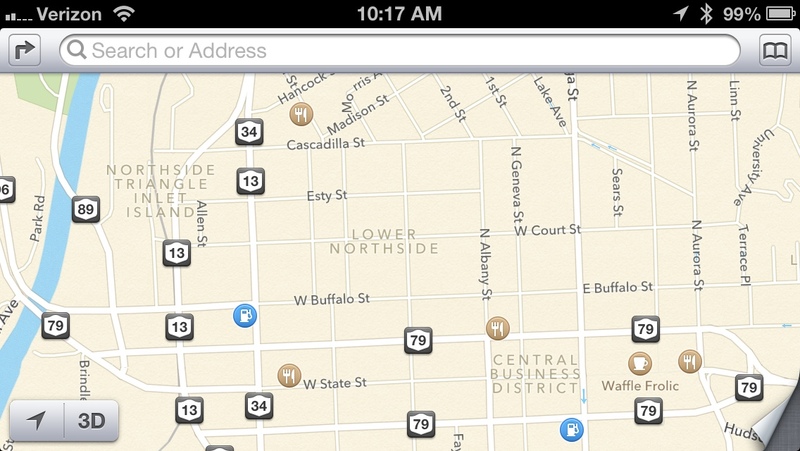 By the way, MapQuest shows Lower Northside too, but I don’t know anyone who still uses them. If mobile is where the mapping action is, there are really only two major players: Google and Apple. Google does not label neighborhoods in Ithaca, but does so in bigger cities like New York and San Francisco. This entry was posted in Maps by soybean. Bookmark the permalink.